This aims to be a Step by Step Guide for New Users. 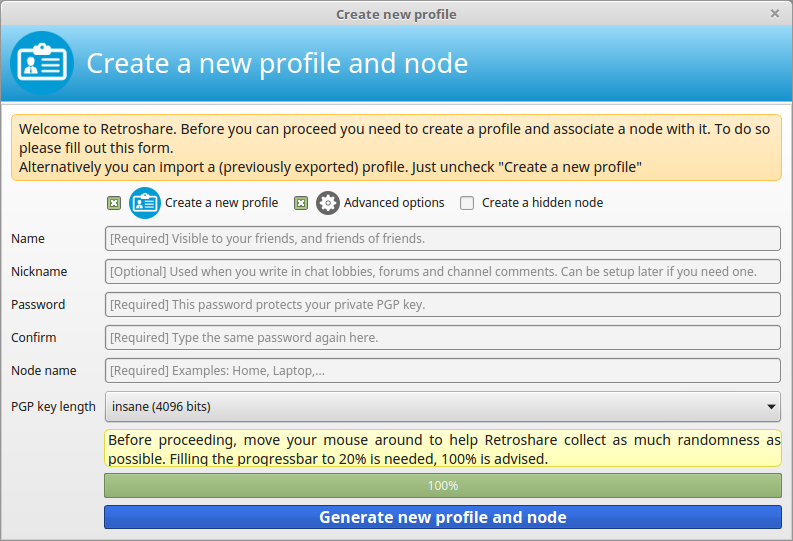 Start RetroShare to create your Node. 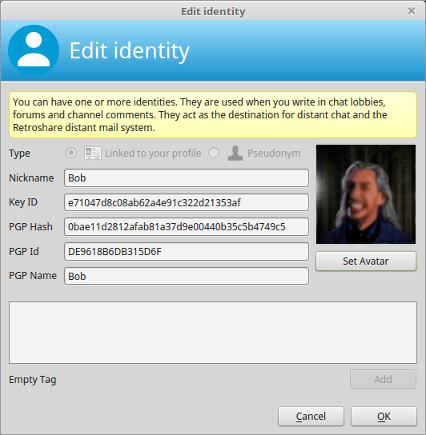 Name of your Account (GPG-ID) Visible to your friends, and friends of friends. Name of your first Identity (GXS-ID) Used when you write in chat lobbies, forums and channel comments. Can be setup later if you need one. This password protects your private PGP key. 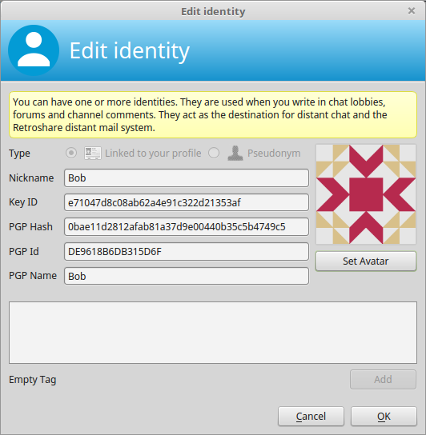 It's wise to choose a long password for your GPG-ID, as this also encrypts your entire RetroShare directory. 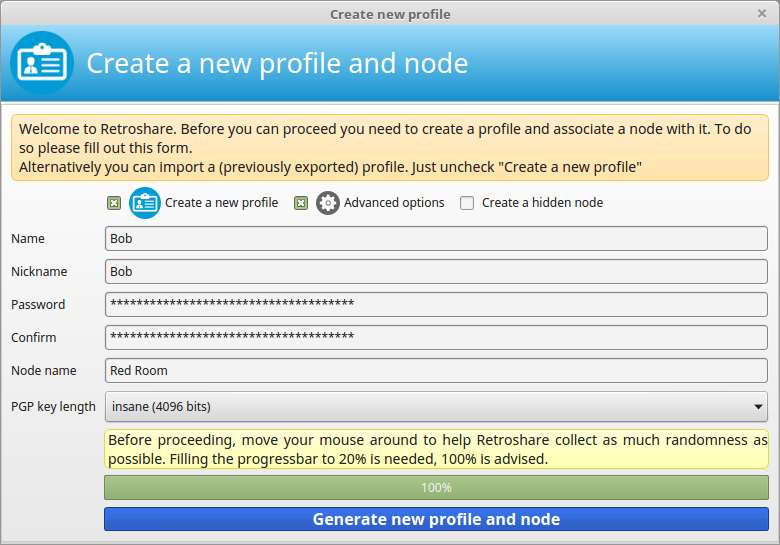 Node Name (Location) Each user can have several Locations were RetroShare is running on different devices with the same GPG-ID. Move your mouse to create randomness for the Key creation. Sign your Certificate by entering your Password. When you start RetroShare the first time it's empty, because there is no content shared by friends. This will change soon with your first connected Friend. This will enable DHT and Discovery to improve the connectivity. 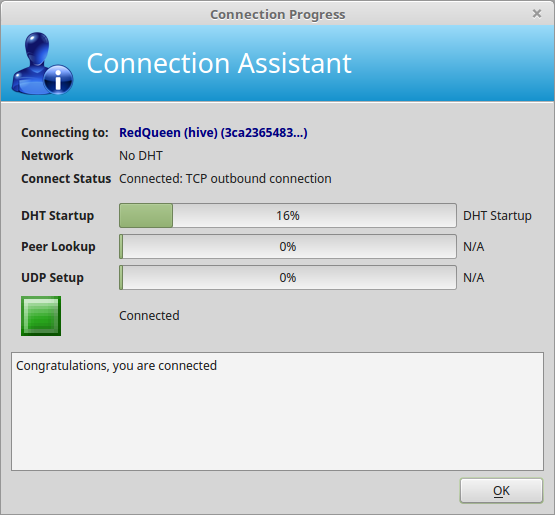 DHT is also recommended to use, because it provides Hole Punching and NAT-PMP technics to open a port in your firewall. If your Router is enabling UPnP, keep UPnP. 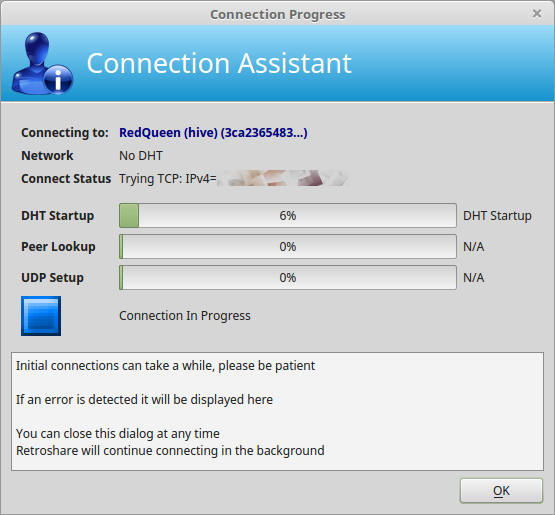 UPnP enables RetroShare to open itself a port on your Router. Otherwise change it to Manually Forwarded Port and set a manual Port Forward to your NAT Firewall. 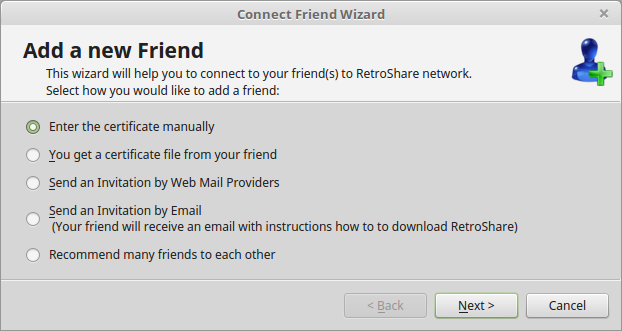 For manual Port forward, you can choose your RetroShare port also. Set your download and upload speeds to fit your Internet Connection. Keeping this setting below of your total speed is recommended. 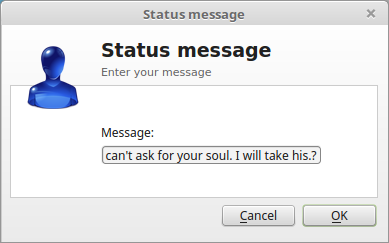 You may want to change the Avatar of your Location and set a Status message. Click on the avatar to change it. Click on the message to change it. 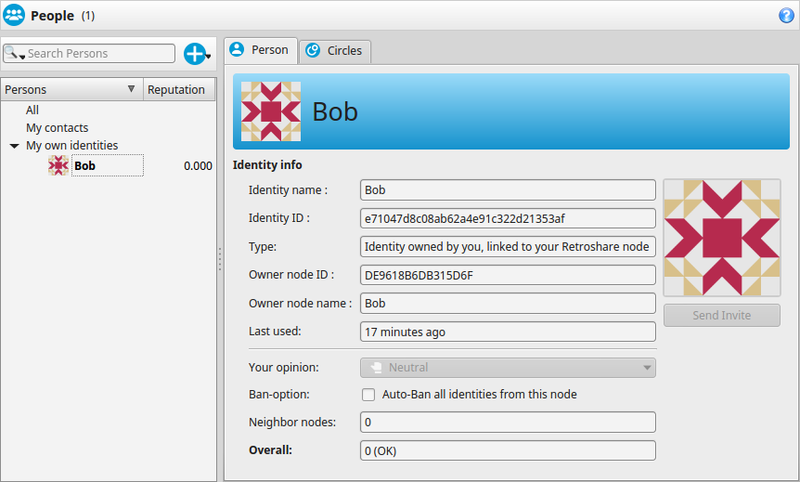 RetroShare has already created a first signed Identity for your use in Chatrooms and Forums and Distant Chats and Mails. You may want to create as many additional Identities as well if needed. 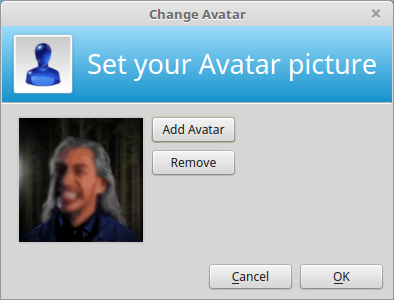 To change the Avatar of your Identity right click it. And change your avatar picture. The fastest way is to exchange the certificates directly with your friends. You can also export them to a file and hand them out manually or send it by mail. It's important to accept each other vice versa. 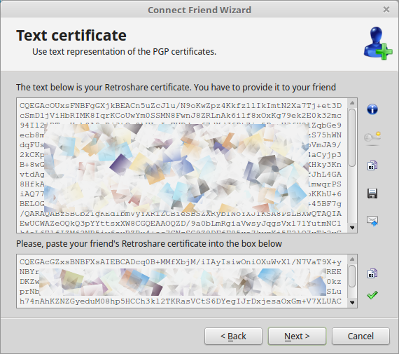 Your friend must add your certificate to his Network/Friendlist. 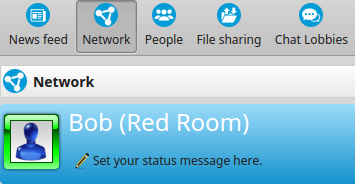 And you need to add the certificate from your Friend to your Network/Friendlist. 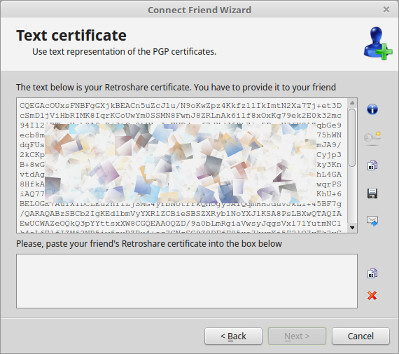 Share your certificate with your friend and request the certificate from your Friend. Have a look at the details and finish. Connection in Progress, your Node tries to connect to your Friend. Your connect attempt has been successful, the connection is established. Your online Contacts(Friend Nodes) will be listed in the Network Tab. Double Clicking will start an instant Chat with your Friends. Subscribed Chatrooms from your online friends are shared to you, and you are free to subscribe and re-share them as well to your friends. 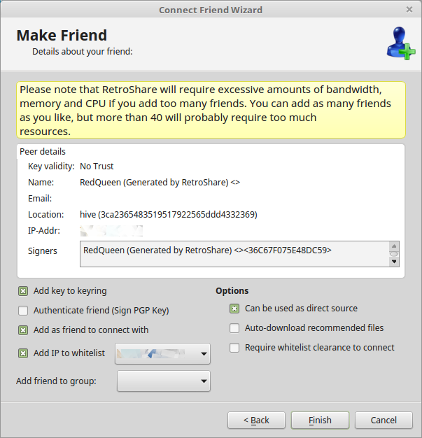 In the same manner Forums, Channels, Posted and File Sharing will become more and more available per direct Friend-2-Friend connections as your network grows.